Dwayne Smurdon, psychology senior and Predictable Data founder, said UT provides networking opportunities for entrepreneurs. Austin, which Forbes calls America’s No. 1 boomtown, has become a technology hub as a wave of innovation and entrepreneurship has come to town — and the University of Texas is trying to catch-up and ride that wave. The University and students groups are working to encourage entrepreneurship on campus, but some students who are starting companies say UT is still far behind in resources other colleges that have played the entrepreneurial game for decades provide. And while entrepreneurial-minded student organizations on campus said they have expanded their outreach this semester, UT is in the middle of addressing a confusing intellectual property policy that may discourage students from pursuing entrepreneurship, as it leaves a student company’s profits exposed to the University’s hands. As the UT System wrestles with its own policies, some student are trying to encourage entrepreneurship. The student-run Longhorn Entrepreneurship Agency is hosting UTEWeek through Thursday, which is meant to introduce students to entrepreneurship opportunities on campus, according to Grant Heimer, finance senior and director of the agency. One of the most important resources students say the University provides is the opportunity to network. Psychology senior Dwayne Smurdon returned to school after several years of running his own businesses largely for these connections. Smurdon, who is now running a data cleaning company, Predictable Data, said he held off of seeking funding for his company so he could focus on finishing his degree. One of those connections is engineering professor Bob Metcalfe, who has dipped a toe into every entrepreneurial pool on campus. Metcalfe teaches Longhorn Startup, a semester-long class that helps kick-start student businesses. The University recently granted Metcalfe new space in Welch Hall for student entrepreneurs on campus. While not as big as its previous office in the engineering building, Metcalfe said the space will function as a co-working space and said he plans to move his office there to further encourage students to use it. “That space is to put a gathering point for entrepreneurs to bump into each other, have collisions, share ideas, be inspired, recruit each other, build teams,” Metcalfe said. Multiple students pointed to Stanford as the model campus for student startups. One of Stanford’s most prominent resources is StartX, a competitive business incubator managed by Stanford students that provides funds to students or faculty launching businesses. Metcalfe said the University is working on developing a similar fund, but the more important issue is the quality of Austin’s student startups, not the amount of money backing them. Another challenge UT’s student entrepreneurial scene faces is a lack of gender diversity. Computer science junior Taylor Barnett, president of the Technology Entrepreneurship Society, said she has been trying to encourage women to join the scene but has not had a lot of success. 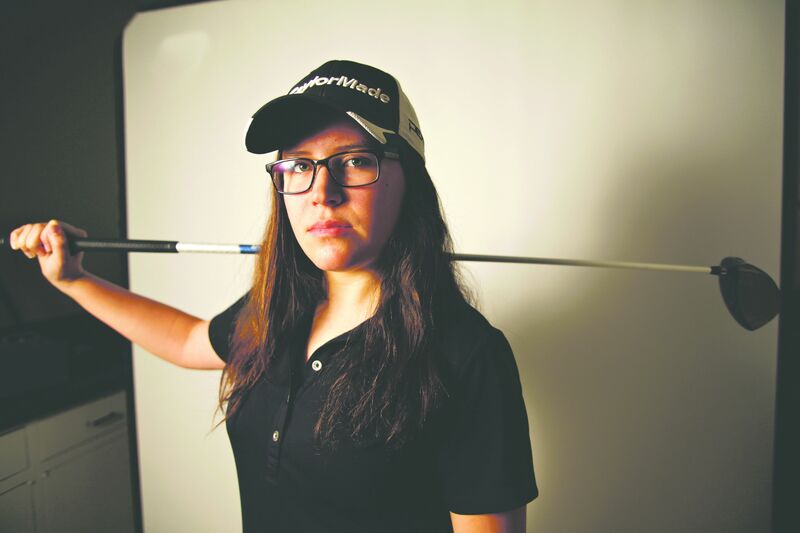 International relations sophomore Margaret Efthim runs Ready Set Golf, a nonprofit in Boston. Efthim said she has noticed a lack of gender diversity in the UT startup scene. Photo by Shweta Gulati​. Capital Factory, an Austin incubator that provides mentorship to new startups, lists 60 mentors on its website, six of whom are women. In interviews, many student business owners echoed concerns about whether the University owns a student’s intellectual property, which would grant the University access to a share of the student’s profits. Students say the System’s policy is not clear on the question of ownership. In December, Paul Foster, chairman of the UT System Board of Regents, created an intellectual property task force to address this and other questions. The task force has not yet released any recommendations. Sanchez said the policy, though unclear, does not threaten students’ intellectual property. Greg Fenves, executive vice president and provost and a member of the task force, expressed a different interpretation of the current policy. Sanchez said UT has never taken the intellectual property from students who are not being paid to do research and development. Sanchez and Fenves both said they hope the task force will ultimately recommend that the board adapt precise language that states students can keep their intellectual property. Dale Klein, System associate vice chancellor for research, who is also a member of the task force, said Austin and UT’s expanding startup spirit is making the System address this issue.